Perhaps we human beings trip ourselves up when we try to get ahead of God and judge who are worthy of welcome or not, writes Good Samaritan Sister Pam Grey. “What is humankind that you remember them, the human race that you care for them?” asks the psalmist in his hymn of praise (Psalm 8), where galaxies are whirling, whales are singing and infants are babbling their joy. The psalmist ponders the mystery of human identity in the presence of God. What was God’s purpose and what was God’s longing that gave birth to humankind? God said: “Let us make humankind in our image, according to our likeness” (Genesis 1:26). Then God handled the clay of earth, breathed the breath of life and people came into being. God saw everything that was made and proclaimed it was very good. God has welcomed us, too, into being. Because all are welcome in God’s purpose and plan, praise and thanksgiving enters our song. But along the way something goes askew. What could it be? Perhaps we human beings trip ourselves up when we try to get ahead of God and judge who are worthy of welcome or not. How did our human hearts become so shabby, when they were meant for joy? Who introduced the look of suspicion, the sneer of contempt, or the chant of derision? On our planet there are waves of people on the move to new lands. They are fleeing destruction of body and soul. They are seeking peace and pursuing it with all they are and the little they have. Will they be welcomed with the words that we ourselves long to hear: “Come to me all who are weary and overburdened and you will find rest for your souls “(Matthew 11:28). With Christ on their side who can be against them? Another welcome is to Country. I once experienced a Welcome to Country with the Indigenous women of the Blue Mountains. A fire was burning on the flat, tessellated rocks high above the valley floor. Smoke arose with the scent of eucalyptus leaves. I was invited forward to the smoke and became enveloped. Words were said that came from deep within the women. I was moved by the women’s passion for Country. Here are people of timeless memory. All is present. All is being. These women can welcome a stranger amongst them because they know who they are and what they value and thus are free to share as they choose. There is a story in Luke’s Gospel about a welcome that turned sour. We read “as Jesus and his disciples went on their way, he entered a certain village, where a woman named Martha welcomed him into her home. She had a sister named Mary, who sat at the Lord’s feet and listened to what he was saying. But Martha was distracted by her many tasks; so she came to him and asked, ‘Lord, do you not care that my sister has left me to do all the work by myself? Tell her then to help me’” (Luke 10:38-42). Hot and bothered, is my first impression of Martha, standing with her back to the fireplace, and looking across the room to her guests. She sees ‘red’ as her eyes clamp onto Mary. She judges harshly, saying: “Don’t you care?” to Jesus, the one who puts his life on the line for those in strife. Then Martha, the host, makes demands on Jesus, her guest. “Tell her then, to help me.” Her words are terse and her back is up. However, Jesus sees Martha differently. “Martha, Martha,” is Jesus’ reply, “you are worried and distracted by so many things”. It is true that she is distracted, so the meaning of what is taking place in her presence, escapes her. Jesus does not reply to her command, “Tell her then to help me,” but instead acknowledges her distress. There is no rebuke, just a kindly revelation. Jesus knows us too, when our attempts at welcome go amiss, or when we turn our eyes from those who need our love. Jesus will say our name and in mercy set us straight. Once again the psalmist prays: “God owns this planet and all its riches” (Psalm 24). It is not to be plundered, but to be shared, for God welcomes each as guest. We cannot be distracted by forecasts and polls, nor sayings of doom. Remember how Mary chose the better part by listening to Jesus, as he told the stories that held the secrets of the Kingdom of God – stories of forgiveness, compassion and mercy, of righting and healing relationships, of values of magnanimity and fair go. Today, who will protect the poor, defend the orphan and welcome the stranger, if not you? This big country is made for big hearts, hearts that are filled with joy. 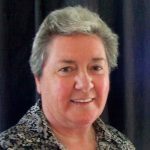 Melbourne-based Good Samaritan Sister Pam Grey is a writer and poet. She also volunteers as a home tutor for newcomers to Australia who need language and resettlement support.